Livestock guarding dogs and livestock herding dogs both fall under the umbrella category of sheepdogs, but it is important to understand that these are two very different dog breeds. Livestock Guardian Dogs (LGDs) were developed and bred to protect livestock from predators such as: wolves, jackals, coyotes, baboons, leopards, bears etc. Herding dogs on the other hand were developed and bred to...well, herd! Livestock guarding dogs date back several thousand years and even as far back as 2000 years ago were a common sight in many parts of the world. Though many of these working dogs were considered until recently as rare breeds in the West, the truth is there are and have been millions of these dogs plying their trade of protecting livestock all over the world. In fact the protection of livestock could well have been one of the first primary uses mankind had for dogs. It is not unreasonable to hypothesize that livestock guarding dogs originated from the Middle East especially when one considers that is from there that livestock was first domesticated. Following this pattern of thought it is not unreasonable either to state that livestock protection breeds may be several thousands of years old though they certainly wouldn't predate the first domesticated animals (sheep; circa 8000 years ago). There are plenty of historical references and drawings of livestock guardian dogs dating back thousands of years. The above list is certainly not an exhaustive one and though some of the breeds are quite well known others are not. A striking feature of most livestock guarding dogs is that they tend to be larger in size than most other canines. This actually shouldn't come as too much of a surprise since these canines were bred to ward off predators some of which attain considerable size such as bears and wolves. Another notable feature about livestock protection dogs is that very often they are white (a characteristic more commonly found in European based breeds). There're a number of reasons to explain the tendency to favor white in these dogs ranging from plain superstition to the age-old myth that white embodies purity of strain. Most local shepherds contend that they prefer white dogs because they blend in with the flock and thus are harder to detect by any marauding wolves or other predators. Another argument along this line of thinking is that the shepherd is less likely to mistake a white livestock guardian dog for a wolf at night and thereby accidentally club it to death. However, whatever the argument, the fact remains that a good number of livestock guardian dogs are white in color which fact probably owes credit to selective culling of litters by local shepherds more than anything else. Livestock guarding dogs tend to have large litters an aspect that bears an obvious economical burden on the shepherd. Not only is it economically unviable for the shepherd to keep all the puppies, the female dog will naturally tend to be somewhat derelict in her livestock protecting duties for the simple fact that she has a large litter of puppies to attend to. Culling by shepherds tends to favor white puppies for all the above listed reasons, which process (known as postzygotic selection--refining a natural breed) ultimately leads to generations that breed pure for the desired white coat. Another driving force motivating culling in favor of white puppies is sales to tourists and foreign breed fanciers who are more willing to pay top dollar for snow white puppies. That said, there are plenty of livestock protection canines that are not white and one interesting feature of several regional breeds is that their coat patterns often have a tendency to mirror that of the livestock they guard. Thus for example the Kangal Dog in appearance has a light dun to fawn-gray coat with a black mask head; this pattern unsurprisingly mirrors the features of the sheep found in the region. Undoubtedly the reason why the Kangal Dog breeds pure for these traits is probably because local shepherds favored those animals that displayed such features. 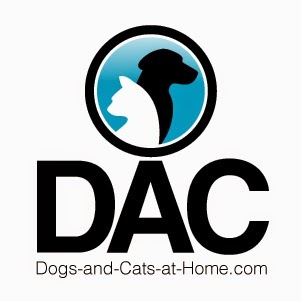 What Defines A Good Livestock Guardian Dog? Generally speaking the bigger the dog the better it will be as a livestock protector. Ironically the impact of increased size is not so much to ward off predators but rather to ensure that the dog can endure the hardships often encountered by these working dogs. In those countries and regions where shepherds still embark on seasonal migratory treks with their flocks covering huge distances, the toll on the animals (both the sheep and the dogs) can be tremendous. A bigger dog has the advantage of not only being able to cover greater distances more easily than a smaller counterpart (larger stride), the bigger dog will also be able to endure food scarcities better because it has greater fat reserves. A large dog also has an added advantage; it can endure harsh, cold weather far better because of less heat loss thanks to its lower surface-to-volume ratio. Very protective of their wards. These are all desirable traits in working dogs employed in the livestock-protection profession and such genetic-based traits are what constitute the "nature" component of the "nature vs. nurture" equation. External factors that influence the behavior of prospective flock guardians (nurture component) include the timely socialization of puppies with their future wards so that they ultimately bond as the dogs primary social companions. 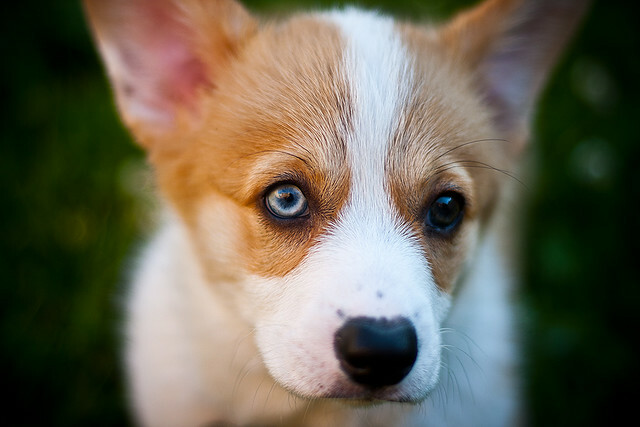 Dogs that make the best LGDs are those individuals that are properly socialized within the critical period (normally from 4 - 16 weeks in canines) and also possess the correct genetic makeup for the task. In other words, inherent livestock-guarding dog breeds that are timely socialized with their future livestock wards will make better guardians than timely socialized dog breeds that lack the innate LGDs genetic makeup. The guard dog or watch dog has one of the most ancient types of canine relationships with humans. It's been conjectured that guard duty was the dog's first job with humans - it may be that the dog was originally domesticated because humans needed an animal to keep away other predators. Perhaps they noticed that many wild creatures feared the wolf, so they domesticated wolves in order to use this to their advantage. Nowadays, guard dogs are actually put up for hire in some areas of the world. You can hire a guard dog to protect your business or home overnight, and then the company picks up the dog in the morning right before your business opens. There is a difference between the two job descriptions, so to speak. The watch dog's job is to alert its owner by barking. The barking might scare away the intruder as well. Watch dogs do not have to be large or aggressive. The guard dog, on the other hand, takes the watch dog's duty's another step. Guard dogs will attack the intruder or restrain him or her. The intruder does not have to be human; guard dogs that guard sheep and other livestock will attack animal predators such as wildcats, bears and wolves. * German Shepherds - The name denotes the origins of this noble breed. With wolf-like characteristics, the German Shepherd worked (and still does work) as a shepherd for livestock. It is not only good at herding; German Shepherds make excellent guard dogs that will fearlessly defend their owner's property. * Rottweilers - This German breed was once a farm and herding dog, and you can still see them in that capacity. They are usually associated with guard duty nowadays, however, and they do have a significant intimidation factor. They also tend to make good family pets if they are raised in a loving environment. * Weimaraner - Popular in photos, the Weimaraner started out as a hunting breed. They were found to have a territorial instinct, though, which, combined with their large size, means they also make good guard dogs. 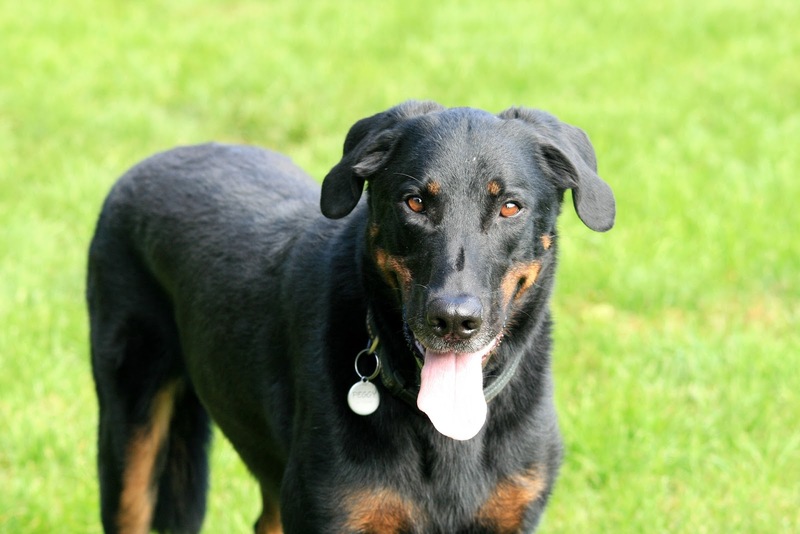 * Doberman Pinschers - Unlike the breeds above, Dobermans were specifically bred to be guard dogs. They are born for guard duty and are staunch protectors and defenders of their families and property. The Anatolian Shepherd is a large dog, standing between 26 inches and 30 inches. There is a height difference between the sexes. This is a powerful dog. The Anatolian Shepherd head is in balance with the body, it has a rounded head, with a rectangular shape to the muzzle. The muzzle is normally black. Their lips are black and the top lip should not over hang the bottom jaw. They can have a scissor or level bite. Naturally, they have pendent ears that hang down. These are mostly black, these should be set no higher than the head plane. Some country's, like their native home Turkey, crop the ears short. Their eyes are almond in shape and have black eye rims, except for the liver colour who's eye rims are brown. Their head is set on a thick neck that is in proportion to their body. It is slightly arched and powerful. They have a chest that is deep and reaches to their elbow. Legs are smooth and straight, set well apart, but in proportion to the dog's body. 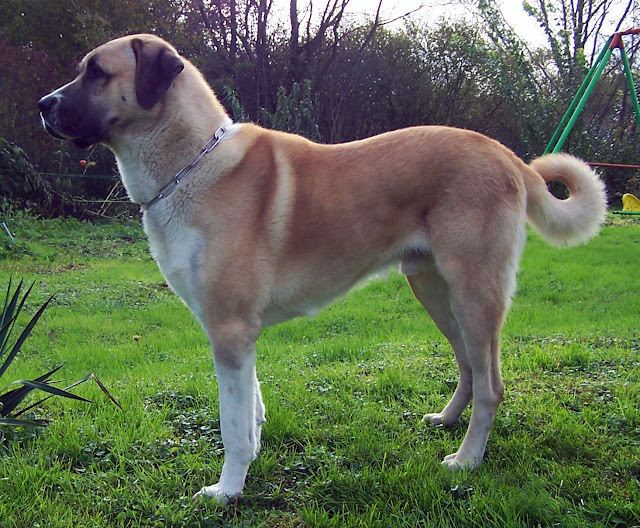 The Anatolian Shepherd tail is high, it is long, and it curls upwards, and when alert their tail curls up and over their back. For showing it is desirable to have a tail that is "wheel" carriage, this means that the tail will not un-curl totally. They have a short coat that is double, the colours can range mostly in the fawn, with a black mask, but you can have brindle, white and pinto. We see two coat lengths medium and medium long, which can vary with the seasons. The Anatolian Shepherd dog has really good hearing and sight. It can be very fast. They tend to be barkers at night. Temperament: While these dogs are shepherding dogs, they are not herding dogs. Their role is of night watching and guarding. The Anatolian Shepherd tend to be noisy at night as they patrol, to ward of predators. They have good hearing and good eye sight, are bright and intelligent. They have a built in protective instinct that cannot be stopped. They need great leadership from their humans and not a dog for the first time ownership. Human leadership is a must for this dog. This dog, if not getting good leadership, will get to think his own way, and will choose to answer a command or not as the case may be. While saying this he is sensitive to being told off and loves to have affection heaped on. The Anatolian Shepherd dog is wonderful with children; they seem to know that a child is safe. In Turkey these dogs live in villages and in the day when they are not working play and sleep around the village seeking affection from the children, they can be very protective of their young wards. While being big this is a gentle dog around the family. The only thing to note is that due to the size of the dog, they may knock the young child over. The Anatolian Shepherd get on well with other animals if introduced. They can be dominant to other dogs so it is best to socialize them while they are very young. Due to their nature, this dog will patrol his territory at night, keeping close watch of their flock or family. If they see or feel that their flock is in danger the fist thing they do is stand in front of the flock to guard them and bark a loud deep bark. If the foreseen danger is not scared away this dog then attacks, this is the last thing the dog chooses to do. This breed needs a lot of socializing while young to allow them to understand what you want and to help with their natural guarding instincts.